How to spot healthy ice cream! Ice Cream is a fun and delicious treat. Children and adults, all the same, enjoy eating. But health-wise, ice creams are not all the same. Some ice creams are significantly healthier than others. Next time you’re at the grocery store shopping for ice cream, pick up some boxes and glance at the labels. There are few ingredients you should be watching out for due to their harmful natures. Here’s a small list of just a few to be cautious of. Calcium sulfate is commonly used as a desiccant, which basically means that it encourages dryness; it absorbs water. For ice cream, it is used as a firming agent help the ice cream not melt as easily. Because of its properties, it is used in stuccos and plasters. It makes things fire resistant. Polysorbate 80 is an emulsifier, meaning that it is a combination of two liquids that don’t naturally mix. In ice cream, that’s referring to the milk and the fats. It makes the ice cream smoother and easier to handle, but again is not naturally occurring. This one is the only one on the list that is naturally occurring. Take that with a grain of salt, though, because it is commonly used in laxatives and relieves constipation. If consumers eat too much Magnesium Hydroxide, they often experience muscle cramps. Outside of ice cream consumption, it is used as antiperspirant and fire retardant. 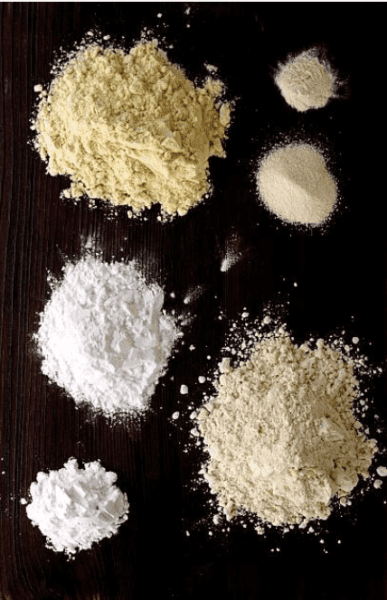 Xanthan Gum is made from mixing fermented sugars together with some bacteria. It is known to lower blood sugars and cholesterol, which can be good for some, but it has also been known to be hard for the human body to digest. Because it is a thickening and stabilizing agent in ice cream, it can double as paint thickener, grout cleaner, and adhesives. Potassium Sorbate is a preservative. It stops the growth of mold, yeast, and fungus. It is relatively less harmful than the other ingredients since it passes through the body quickly, but it has been known to cause skin irritation. These two also act as emulsifiers and preservatives. It commonly is a trans-fat as well. Because the tongue can only taste flavors like sweet, sour, salty, spicy, etc., artificial flavorings are often used. It is used to either enhance flavors for weaker tastes or to save money on otherwise expensive foods. The FDA doesn’t require that the ingredients in “artificial flavors” be published. Many of the ingredients in this ambiguous term are also used in tars and crude oil. Fortunately, Creamies steers clear from these harmful ingredients. Those flavors you love, namely banana, chocolate, strawberry, vanilla, root beer, raspberry, cherry, cookies and cream, mint, and peach, are made naturally. No artificial flavorings are used. So you can eat your Creamies, rest assured that you are not putting harmful ingredients into your body. Healthy ice cream bars are better ice cream bars.